If you're looking for a really fun, fast-paced, spooky summer read, pick up a copy of Haunted Rock and Roll, by Matthew L. Swayne. It's a wonderful collection of all the legends, curses, and hauntings that permeate the rock and roll industry. The book begins where it all started---the strange tale of the Grandfather of Rock and Roll, Robert Johnson, and his mysterious trip to the crossroads. Other tales of interest include the 27 Club (of which you do NOT want to be a member), the Buddy Holly Curse, and Ricky Nelson's haunted house. The book is divided into four sections: 1. Rock Star Ghosts, 2. Haunted Studios and Concert Venues, 3. Premonitions, Signs and Omens of Rock and Roll, and 4. Rock and Roll's Most Famous Curses and Mysteries. Each section is filled with chapters providing the best examples of each category. 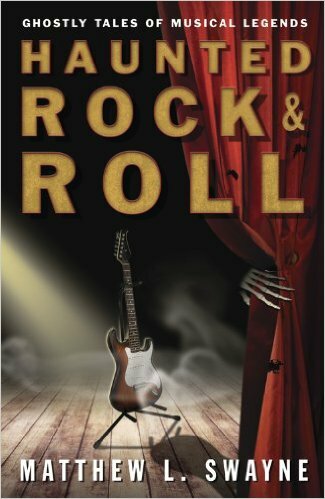 As I said, this is a fun read, and I definitely recommend it for light reading into the subject of ghosts and rock and roll. For the most part, it was well-written and informative without being boring. However, there were some issues with the formatting that bugged me. It seemed like some of the information overlapped pretty hard---sometimes information would be repeated in various places in the book. Sometimes, a story would be broken up over different sections, with references back and forth between the chapters. I personally prefer books of this nature to be a little more clear-cut and wrap up nicely within a chapter. Still, it was a nice way to kill some time and learn about a few things I wasn't familiar with. Of course, most people interested in ghost lore will have heard of many of the spooky things discussed in the book, such as the 27 Club, Led Zeppelin's occult dealings, etc., but there are a few more obscure references (like the Fohn/Foehn Winds) that make the book worthwhile. Give it a read for yourself and let me know what YOU think!